Chest extended and head tilted back in a haughty matter, Beach Bully suddenly assaulted another early morning beach stroller. The peace of still water and wet sand exploded as the two seagulls flew at one another with beating wings and sharp beaks. Beach Bully had picked on a young gull, still clothed in grey fluff. Squawking, the gull’s sibling flew into the fray. United in their efforts, the two family members sent Beach Bully stalking away. Beach Bully, with ruffled feathers and chest still extended, attacked a lone crow. The crow, being smaller, quickly flew away from the fight. Beach Bully strolled into a gathering of gulls that were socializing and feeding along the shore. Again, he selected a young grey gull for his attack. This time it was the baby’s angry parents that shrieked and dove at him until he flapped off down the beach away from the crowd. 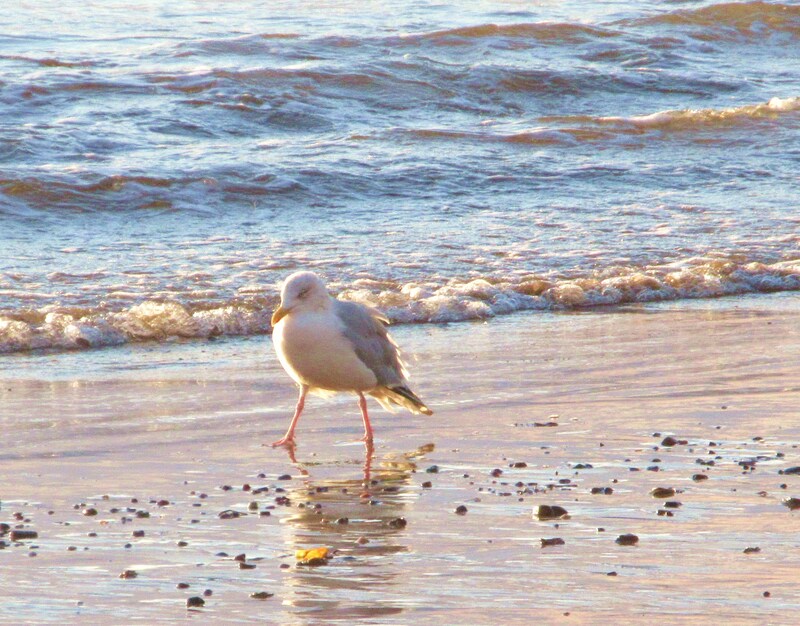 Beach Bully stood on wet sand surveying his lonely kingdom. His chest deflated. His head sank down on his shoulders. Even in the animal world, bullies are not liked or tolerated. Sadly, I know some human bullies who live in a world of isolation that they have built with their cruel, angry words and actions. I felt a bit sorry for Beach Bully. How could he learn kindness and friendship? Did he have an example to follow? What had made him that way? Did his parents abandon him when he was still too young to fend or himself? I will never know the answer to those questions, but I do know the solution for human bullies. As with all problems needing solutions, the Bible holds the cure for human bullies. To have friends, we are told in Proverbs 18:24, we must prove ourselves to be friendly and worthy of being a friend. A friend loves at all times. Jesus set a timeless example of friendship. “Greater love has no man than this, that a man lay down his life for his friends.” (John 15:13) Then Jesus proved His friendship by dying for us so we can go to Heaven to be with Him. Jesus is the Lord God of all creation. He is God’s Son. Even Jesus was not immune to bullies. They cursed Him, spit on Him, nailed Him to a cross to die. Every day since sin entered the world and Adam and Eve’s son Cain killed his brother Abel, there have always been bullies. We can bully-proof our worlds as much as possible by living the fruit of the Spirit and surrounding ourselves with Christian friends and praying for our enemies. Because sin still rules this world, that won’t be a one-hundred percent fix – but we will walk in love and joy and leave beach bullies behind to face their torment and make their decisions. Posted on September 19, 2015 by authorstephanieparkermckean •	This entry was posted in Uncategorized and tagged Bible, bully, Christian, friend, god, Jesus, seagull. Bookmark the permalink.